Wedgwood the Restaurant is the eponymous restaurant from one of Scotland’s best loved and well respected chefs, Paul Wedgwood. Together with his wife Lisa they have created an award winning restaurant which is popular with locals and visitors to the city. 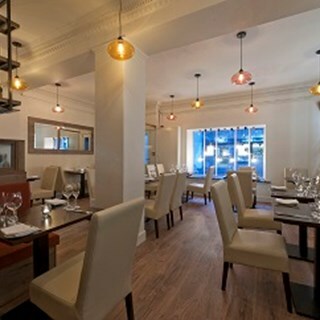 Set in the heart of Edinburgh’s historical old town on the famous Royal Mile the restaurant rightly deserves its reputation as one of the best in the city & has a whole host of accolades to show for it. In 2016 it was named “Best restaurant outside London” in the Food & Travel Reader awards beating a host of Michelin starred establishments to take the title. Add to that a listing in The Sunday Times’ Top 100 UK Restaurants, SLTN’s “Wine List of the Year” and more than a handful of accolades & commendations from the UK’s top restaurant critics and guides and you can be guaranteed that a meal here is a very special culinary experience indeed. Diners who indulge in the unique “deciding time” option upon arrival will be treated to a glass of Champagne and canapes while they take their time to peruse the menu. Paul’s seasonally changing menus never cease to amaze and delight; whether it is the two or three course lunch menu or the full a la carte, the innovation, skill and high quality ingredients shine right through all the dishes from Lobster thermidor crème brulee, bloody mary sorbet, parmesan shortbread to Venison, red cabbage, apple and black pudding bon bon, smoked beetroot, rowan to the final flourish of dessert which just might include the Very sticky toffee pudding, Caol ila butterscotch and vanilla ice cream. 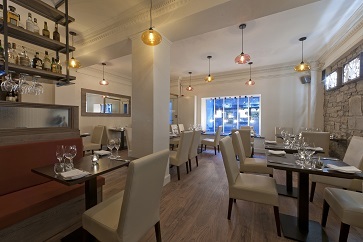 Refurbished at the start of 2016 the restaurant is Paul and Lisa’s vision of their “perfect night out”: The chic dining room is light, bright, stylish and inviting featuring comfortable banquette seating and low lighting making the atmosphere both relaxing and intimate – the perfect setting in which to enjoy Paul’s outstanding menu and Lisa’s immaculately paired wines. We had a lovely three course lunch. Some elements needed a little extra seasoning but there was Maldon sea salt on the table so all was well. Service was exemplary and we learned a new word from one of the waiting staff: 'hoaching' - a good word. We'll definitely go again. I cannot stress enough how perfect our evening was. We were celebrating my father-in-law's 80th birthday, and we couldn't have been better looked after. The attention to detail, the informally formal service, the deciding time champagne and canapes, the food and wine, even allowing us to bring in our own cake which was delivered to the table after the dessert, everything was handled perfectly. This is not the cheapest of restaurants, but I sincerely believe that you get what you pay for, and the food really does speak for itself. I would recommend the dessert cocktails, delicious! My father-in-law had a perfect time, and that was all that mattered. We look forward to returning sooner rather than later. I have dined here since they opened every time I am in Edinburgh. I adore it. I recommend it to all my friends. The food is superb! Fantastic, elegant food with excellent service!! We had the 7 course menue with wine pairing and it was absolutely fantastic. Each course represented a small traditional dish made from seasonal scottish produce. We enjoyed every bit of it and would highly recommend this wonderful tour of scotland. Excellent meal - we had the tasting menu and it was lovely. The staff were very attentive and knowledgeable with all the dishes. All in all a great experience. Great value as well! We visited with a party of eight adults including one vegan. The food and service were exemplary and the effort made to provide cater for our vegan friend was first class and very much appreciated. Excellent lunch combining great food, wine and service. Will be back soon. Me and Mum visited the restaurant together and had the lunch deal the flavors and food were delicious. We will definitely visit again. Ideal for a special occasion or for any occasion that then becomes special. Really lovely evening, staff were friendly, attentive and knowledgeable about the food and the drink served. We left feeling very full and very well looked after, thank you to all! All the staff that we came into contact with were excellent. The food was delicious & memorable! We enjoyed it very much! Michelin star worthy. Fantastic level of service & quality of food by Paul & his team every time we visit & there has been many visits! Never disappoints, always interesting to see what foraged foods appears on the menu, this time Gorse ice cream just Devine! Well worth a special trip from Glasgow, just wish we had this restaurant here! Fabulous scallops. Nice wine selection. Would love to go back again. Second visit to the Wedgwood and there will definitely be further visits. Imaginative menu of delicious food. Service was well nigh perfect, thank you, The salt-baked celariac with cocoa was an experiment that worked, the lobster thermidor creme brulee not so much, in my subjective opinion. I am really no lobster thermidor expert but I thought (could be wrong) that they are usually served warm, which I think would have been better (I understand that the logistics of that might be difficult). Still can't decide if the scallops with korma is a good or bad idea, so guess your experiment has got me thinking. Both the Marlborough S-B and Malbec were great. Fantastic meal. Interesting hip take on Scottish cuisine. Beautifully prepared food. Lovely atmosphere and very attentive staff.